Today was the Yorkie Angel Patrol Get Together. The best way to describe this group is a collection of pet owners whose beloved pets have been affected by some tragic conditions. These people are dedicated to educating themselves and others about Collapsing Trachea, Liver Shunts, and Granulomatous Meningoencephalitis (GME). Yorkie Angel Patrol is not just for Yorkies; it is for all dogs who suffer from these conditions. It is a source for education, resources, and support. The gathering that took place in Knoxville, TN is a celebration of the memories of those beloved pets lost, the recent successes, and hope for the future. 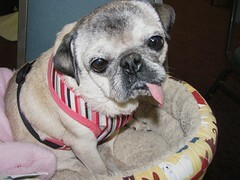 For those of you who are not aware, Baby Girl came into rescue with Southeast Pug Rescue and Adoption with a Collapsed Trachea. Her airway was constricted by a Grade IV (>75%) collapse which affected her breathing and ultimately her whole body. We were fortunate to have the University of Tennessee Veterinary College so close to us. On May 15, 2008, Baby Girl had a titanium stent placed in her trachea. This procedure literally saved her life. The people who are involved in YAP have been invaluable to me also! You are currently browsing the papaspugs.com Blog blog archives for May, 2010.